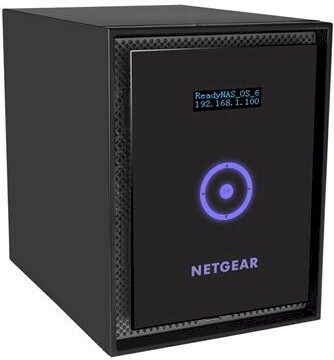 There has been a, uh, slight gap in our coverage of NETGEAR's now not-so-new revamped ReadyNAS line. The last review was the RN516 back in Sept '13. In that review's closing thoughts, I declared the RN516 a top-performing NAS, but bemoaned its lack of 10GbE port(s) to make full use of its power. But the SNB NAS Testbed wasn't up to the task of properly testing 10GbE class NASes anyway. So NETGEAR decided to hold back the RN716 until we upgraded the testbed. Fast forward to our recent review of Thecus' 10GbE-equipped N7710-G using our brandy-new, Revision 5 NAS testbed. NETGEAR apparently took note, because an RN716 showed up on my doorstep a few days later. If you can think of the RN516 as a more powerful (and expensive) version of the Intel Atom powered RN316, then the RN716 is an RN516 with a more powerful Intel 2.5 GHz Quad-Core Xeon Ivy Bridge CPU and four times the 516's 4 GB of ECC RAM. The spec comparison chart below taken from the ReadyNAS 300 / 500 / 700 datasheet has the rest of the comparative details. Since we're looking at the same chassis for both the RN516 and RN716, I'll skip further commentary and direct you to the RN516 review if you want it. The ReadyNAS 716 uses the same chassis as the RN516, so I am reusing the internal shot from the 516's review below, showing the rear panel removed after unplugging the fan and AC power cables. If the 716's board isn't the same as the 516's (except for the different processor and possibly, companion device), it's pretty close to it. The dual 10GbE ports are supplied by an Intel X520-T2 adapter, the same we use in the Revision 5 NAS Testbed. As I noted in the 516 review, the Intel board plugs into an adapter plugged into the PCIe x4 slot on the main board. Both DIMM slots are filled with innoDisk 8 GB DDR3 ECC DIMMs for a total of 16 GB. The key components are summarized in Table 1 with the RN516's for comparison. The RN716 comes only in a diskless configuration, but NETGEAR supplied the RN716 with six SanDisk X210 128 GB SSD's (SD6SB2M128G1022I). As is our test standard for high-performance NASes, however, I removed those and ran tests with four WD Re 3 TB (WD3000FYYZ) drives. Power consumption with those drives measured 62 W. I couldn't measure power consumption with the drives spun down because idle drive spindown is not supported. Power consumption with the six SanDisk SSD's was only 27 W! Fan and drive noise were classified as medium since the NAS was clearly audible in my quiet home office with the WD Re drives in use. I noticed that fan speed occasionally increased under load during testing. Fans also come on with a roar during initial boot. Since the feature set is the same across all ReadyNASes that support OS6, see the RN104 review and Craig's in-depth look at OS6. I was surprised to still see no iSCSI initiator support and asked NETGEAR why. They said that storage expansion via iSCSI was too slow and that storage expansion can be done using eSATA and its 5 bay Expansion Chassis. NETGEAR also said that idle drive spindown support is still planned for OS 6.2 and confirmed that they do not yet support SSD cacheing. App count has also increased since Craig's OS 6 review in June 2013. There are now 77 apps shown on the Apps > Available Apps tab in the admin GUI. Finding an app involved scrolling through a long single page. The list can't be sorted or filtered and apps aren't grouped by type or tagged. Firmware tested was OS 6.1.7. After I was halfway through testing, 6.1.8 was released. But NETGEAR told me there were no performance differences, so I didn't update and retest. I ran our Revision 5 NAS test process on four-drive RAID 0, 5 and 10 volumes using WD Re 3 TB (WD3000FYYZ) drives with 1 Gbps and 10 Gbps LAN connections. The 10 Gbps connection was directly between the NAS Testbed and RN716 (I have no need to invest in a 10GbE switch at this point). I ran tests with Continuous Protection disabled and no volume encryption. The Benchmark Summary below for the benchmarks with 1 Gbps connection shows pretty consistent 100 MB/s-ish Windows File Copy write and read performance for RAID 0, 5 and 10 modes. Not so good are the single-digit NASPT Directory Copy to NAS (i.e. write) results for all three volume types. NETGEAR explained this is because they have configured btrfs to check upper case/lower case in file names (useful for NFS). They confirmed that this has a significant performance penalty and that they are considering making this a user-selectable option with the default being off in the future. iSCSI target write and read performance to target created on a RAID 5 volume is better for write (95 vs. 91 MB/s) and the same for read (95 MB/s) compared to the only other quad-core general purpose processor based NAS we've tested, Thecus' N10850. Your best option for attached backup looks like USB 3.0 with an NTFS formatted drive, which completed the test with an impressive 124 MB/s! The Benchmark Summary below for the benchmarks with 10 Gbps connection shows very impressive results with the large file copy tests coming in at mid-to-high 500 MB/s values and reads as high as as 845 MB/s! But you get brought right back down to earth when looking at the NASPT Directory Copy, Content Creation and Office Productivity that involve a lot of random drive head movement to handle many directories of smaller files. iSCSI target write and read results show you'll also get a throughput boost from 10GbE with 346 MB/s write and 438 MB/s read on a RAID 5 volume. I promised NETGEAR I would run some benchmarks using the six SanDisk SSD's. I configured them all into a RAID 10 array (for a whopping total of 332 GB of storage) and ran the benchmark suite. Table 2 collates and compares the results, which do not show a consistent performance improvement with SSDs. Best gain was 173% for Windows File Copy Write, while the the worst was a 30% loss in the NASPT Directory Copy test. We've tested only one other Xeon-class NAS, Thecus' 10-bay Top-Tower N10850. The N10850 will set you back around $2,000 vs. the $2,700 or so for the six-bay ReadyNAS 716. But the Thecus has 10GbE as an option, not standard. Our NAS Ranker, which doesn't take 10 GbE results into account, currently has the Thecus in the #1 spot. The ReadyNAS 716 is ranked #12 and tied with the recently-reviewed Thecus N7710-G. I've pulled the Ranker Performance Summaries for all three products into the composite below. As you might expect, the Directory Copy reads and writes are the 716's weakest point. On the other hand, its best sub-ranks are for video, backup and iSCSI. If we just compare 10GbE performance, then we are limited to the Thecus N7710-G. Running down the benchmarks, its clear that the NETGEAR, with its more powerful processor is the overall winner. But RAID 5 performance seems much more equal, except for the Thecus' 385 MB/s NASPT File copy to NAS vs. the NETGEAR's 272 MB/s. I am glad to see 10GbE ports come standard on a few NASes. But more widespread adoption should probably wait until prices come down some more so that more people are able to afford to use them. You'll get the most benefit from 10GbE if you're moving multi-Gigabyte sized files to and from a NAS or trying to move lots of video streams. If your data consists of lots and lots of folders of small files, our benchmarks show you won't get as much benefit. If you decide that 10GbE is worth it, don't want to hassle with installing your own card and are willing to pay around $2,700 (without drives) for the convenience, the ReadyNAS 716 could be your NAS.